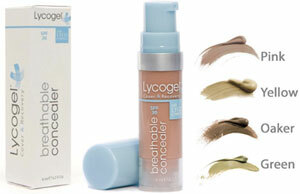 Lycogel is the first breathable colour corrective treatment that combines cosmetic and skincare technology to promote post procedure healing, soothe sensitive skin, rejuvenate and camouflage at the same time. It is the next generation camouflage and concealer as it combines a breathable Triple Silica Gel Base with LYVO Complex, a carefully balanced set of bio-active agents that work synergistically to improve the skin. Lycogel can be used as your everyday foundation as it allows the skin to breath, it provides a ‘second skin’ texture and is a weightless, natural finish. It improves skin texture and leaves the skin looking flawless.